1739: born in Edo in the district of Fukagawa. He is the son of Matsumoto Saiemon, the owner of a chaya located within the precincts of the Hachiman Shrine. 1800: he is adopted by Naoeya Jûbê (later Katsu Hyôzô II). 11th lunar month of 1802: he makes his debut on stage at the Ichimuraza, where he performs under the name of Nanboku Ushizaemon as a koyaku in Fukumori Kyûsuke I's kaomise drama "Toki-ni Ôshû Tsubo no Ishibumi". 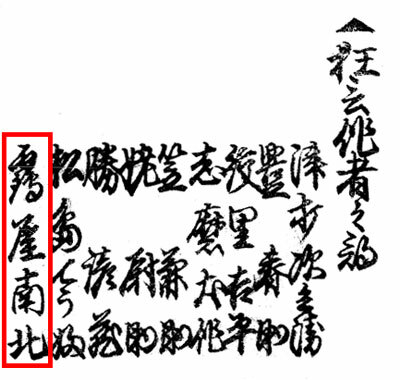 7th lunar month of 1805: Ushizaemon plays at the Ichimuraza the role of Tarokichi in the drama "Genpei Nunobiki no Taki"; the roles of Saitô Bettô Sanemori, Koman, Senoo Jûrô Kaneyasu, Aoi Gozen and Kurosuke are played by Sawamura Gennosuke I, Nakamura Utagorô, Ichikawa Danzaburô IV and Arashi Kanjûrô I. 1821: he becomes sakusha and his first pen name is Tsurumine Sensuke I. 1824: he occasionally performs on stage as a dôkegata; his new stage name is Tsurumine Ushizaemon. 11th lunar month of 1825: he becomes sanmaime sakusha at the Ichimuraza and takes the name of Tsuruya Magotarô IV. 27th day of the 11th lunar month of 1829: Tsuruya Nanboku IV dies in Edo. 11th lunar month of 1831: he becomes tatesakusha and works at the Kawarasakiza on the drama "Matsu o Chikara Tomoe no Fujinami", which celebrates the shûmei of Sawamura Tosshô I. 11th lunar month of 1832: he takes the name of Uba Jôsuke II and works at the Kawarasakiza on the drama "Tanomiaru Gohiiki no Tsuna", which celebrates the shûmei of Yamashita Kinsaku IV. 1833: he takes back the name of Nanboku Magotarô IV. 2nd lunar month of 1835: premiere at the Ichimuraza of "Ume no Haru Gojûsan Tsugi" , a drama written by Mimasuya Nisôji, Nakamura Jûsuke IV and Magotarô. 3rd lunar month of 1837: he takes the name of Tsuruya Nanboku V at the Nakamuraza, where he works on the drama "Yayoi no Hana Oedo no Irifune". 11th lunar month of 1837: Nanboku works, along with Mimasuya Nisôji, at the Kawarasakiza (which celebrates its reopening!) on the drama "Sekai ha Taira Ume no Kaomise". 11th lunar month of 1838: Nanboku works, along with Mimasuya Nisôji, Sakurada Jisuke III, Nakamura Jûsuke IV and Matsushima Chôfu II, at the Nakamuraza on the drama "Isse Ichidai Kuriki no Myônoji", which celebrates the isse ichidai performance of the Edo star Onoe Kikugorô III. 11th lunar month of 1839: Nanboku works at the Nakamuraza on the drama "Sumidagawa Yukimi no Jindachi". 11th lunar month of 1840: Nanboku works at the Nakamuraza on the drama "Yasa Heike Kabuki no Gunbai" with Bandô Hikosaburô IV as zagashira. 11th lunar month of 1846: Nanboku works at the Ichimuraza on the drama "Gekiryômaru Ichiban Ikari", which celebrates the shûmei of Nakamura Gennosuke II. 1st lunar month of 1847: Nanboku works in the same theater on the new year sogamono "Fuji Nikki Kakizome Soga". End of 1847/beginning of 1848: Nanboku goes to Kamigata. 1st lunar month of 1848: Nanboku works at the Naka no Shibai, along with the Ôsaka sakusha Namiki Saemon, on the new year drama "Keisei Soga Kamakura Daijin". 9th lunar month of 1848: Nanboku works at the Kado no Shibai, along with Namiki Gohei III, on the classic "Sugawara Denju Tenarai Kagami", which stars Ôkawa Hashizô I (Kan Shôjô, Shundô Genba), Ichikawa Ebizô V (Kakuju, Matsuômaru), Arashi Rikan III (Sukune Tarô), Arashi San'emon IX (Tatsuta-no-Mae, Chiyo, Yae), Ôkawa Sanchô (Umeômaru), Ichikawa Sukejurô (Takebe Genzô), Onoe Eizaburô IV (Princess Kariya) and Ichikawa Shikô III (Terukuni, Sakuramaru). 1st lunar month of 1849: Nanboku works at the Naka no Shibai, along with the Ôsaka sakusha Namiki Saemon, on the new year drama "Keisei Ishikawa-zome". Spring (?) or Summer (?) 1849: Nanboku goes back to Edo. 9th lunar month of 1851: Nanboku works at the Ichimuraza on the drama "Genji Moyô Furisode Hinagata". 21st day of the 1st lunar month of 1852 : Nanboku dies in Edo; his tombstone is located in the precincts of the Shingyôji temple. Tsuruya Nanboku V's greatest achievement was the transmission of the heritage of Tsuruya Nanboku IV, the major playwright of the first half of the 19th century, to Kawatake Shinshichi II, the major playwright of the second half of the 19th century. Tsuruya Nanboku V was not a genius like Tsuruya Nanboku IV but he successfully raised the talent of a future genius. The 21st day of the 1st lunar month of the 5th year of the Kaei era was the 10th of February 1852 in the western calendar.